Back on July 19, I was biking over to Tuesday Night Track when the front tire of my road bike slipped on some cable car tracks I was crossing, causing me to hit the ground hard on my left side. It was so sudden that I had no time to react—to unclip and put a foot down, for example—and my left arm took the brunt of the impact. The fall stung enough that I lay on the ground for maybe half a minute while some kind bystanders came over to see if I was all right, and after getting up I walked around the block to assess how my body felt. I had little road rash but my left arm and wrist had enough pain that I ultimately had an über take me home. I never made it to track practice. I iced the wrist when I got home and took an Advil in the middle of the night as the pain was about a 7 (on a scale of 1-10) while trying to sleep, and by the next day the pain was down to maybe a 2-3 so I never took any pain relievers since. I hoped I had only an internal bruise as my arm did not look discolored. But by the second day I still could not bend my arm more than maybe 40 degrees without pain so I arranged a consultation with my primary physician a second morning after the accident. 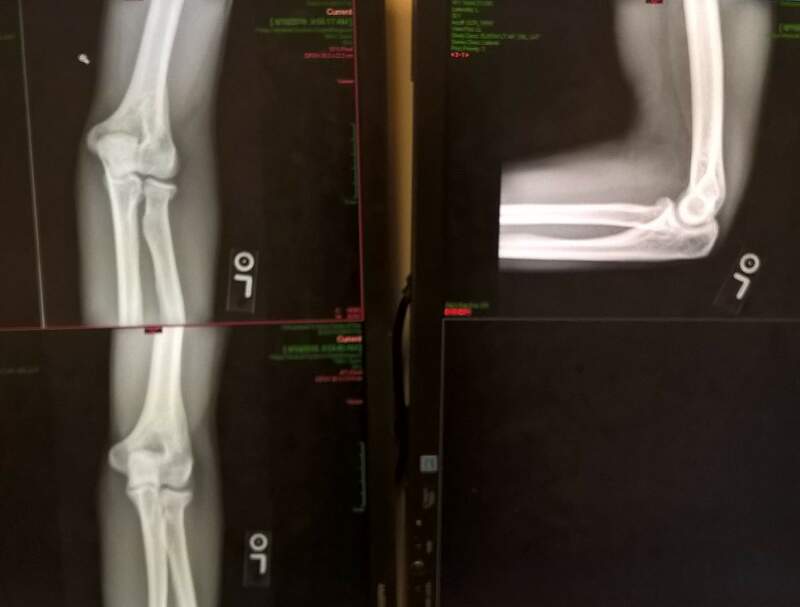 Electronic x-rays were taken. “Let me show you what you did here,” as my doctor showed me a fracture in the head of the radius bone of at my left elbow. Oof. My goal about writing about my experiences here is to help give people some idea of what to expect if this happens to them. Twenty years ago, when I was an undergraduate at Stanford, I was biking to class (remarkably, on the same Cannondale road bike) when I came upon a pedestrian who stopped in her tracks. To avoid crashing into her, I squeezed the front brake a little too hard while standing out of the saddle, causing me to “endo” over the handlebars. I landed on my right arm, got up, and continued on to class. My arm was in pain the rest of the day and after realizing the arm hurt enough that I could not even use it to bring a fork to my mouth, my dad came for both moral support and to take me in to the Stanford clinic for x-rays. (Thanks Dad.) The initial diagnosis was “a bruise” as the doctor on hand did not see anything broken. However, the next morning the clinic called me to say they had found a hairline fracture. They recommended keeping my arm in a sling they had given me “for three weeks,” but I ultimately ignored that advice after less than a week. After five days, not only was not wearing the sling, but I was doing things like carrying my bike uo stairs with the injured arm over my shoulder. But I was young and free. This time my recovery time was a little longer, probably due to a slightly higher severity of fracture and being a couple decades older. I was given a custom-made, removable flexi-cast made out of fiberglass and velcro that kept my left arm in a neutral, 90 degree position. I was instructed to keep my arm in it for three weeks but to take it off to shower, sleep, and several times a day to flex my arm to prevent stiffness and atrophy. The doctor also strongly recommended not to run for at least three weeks, lest I to risk displacing the fractured head of the radius bone and causing healing complications. 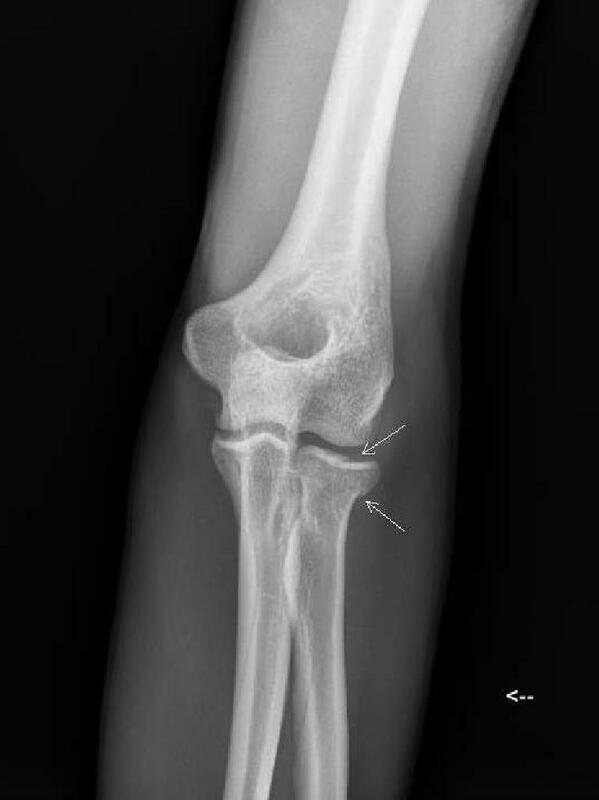 The elbow would be healed within six to eight weeks, the doctor told me, although I might experience some stiffness and popping for some months after. Once again I found the “three weeks” recommendation of keeping the arm basically immobile too conservative, and only wore the flexi-cast while I was out doing errands until Day 8. Then I did not wear it at all. I also made an effort several times a day to slowly test (bend and move) my arm, noticing slight improvement every day. I did heed the warning about not running for three weeks, however. The six-to-eight week healing timeline seemed to be very accurate in my case. Below is a log of some milestones. Day 3: Arm had about 45 degrees range of motion. Day 6: Could supinate hand fully (but with some pain) for first time. Day 8: No longer wearing flexi-cast. Arm had about 85% range of motion. Day 10: Arm had about 90% range of motion. Day 14: Arm had about 95% range of motion. Day 16: Some pain in forehand after lifting garbage can, thus wore flexi-cast for rest of the evening. Day 22: Doctor’s checkup with x-rays. Fracture filling in with calcium nicely. Doctor said he could still feel some fluid around elbow which was preventing final seven degrees of extension. Day 24: Did one push-up on knees. Felt a little bit of pain in forearm. Day 25: Georgetown-to-Idaho Springs Half Marathon. No trouble with arm. Day 27: Did one push-up on knees. Felt a little bit of sharp pain in elbow so stopped before completion. Day 29: Dind one normal push-up with no pain. Day 30: Did three normal (but slow) push-ups. Felt fine with a little bit of soreness in elbow. Day 31: Ragnar Trail Angelfire. No trouble with arm. Day 38: Did one pull-up with no problem. Climbed for the first time, including 5.7, 5.8, 5.8, 5.9, 5.10, and ~5.10. No problem! Day 39: Did three pull-ups and three-dips with no trouble. Day 41: Did 3X5 normal push-ups but elbow had some creaking and a little bit of pain in the last set. Day 44: Still have clicking and unsmoothness in elbow while during dips and pushups. Day 47: Was able to do 8 pullups and 8 dips with minimal discomfort, but 10 pushups caused slight discomfort in elbow. Day 52: Did 50 (10+9+8+7+6+5+4+3+2+1) pushups with slight discomfort if went at a normal (faster than slow) pace. Did 15+10+10 (=35) pull-ups and 30 dips with no problems. Day 55: Did 50 (10+9+8+7+6+5+4+3+2+1) pushups at normal pace with no discomfort. 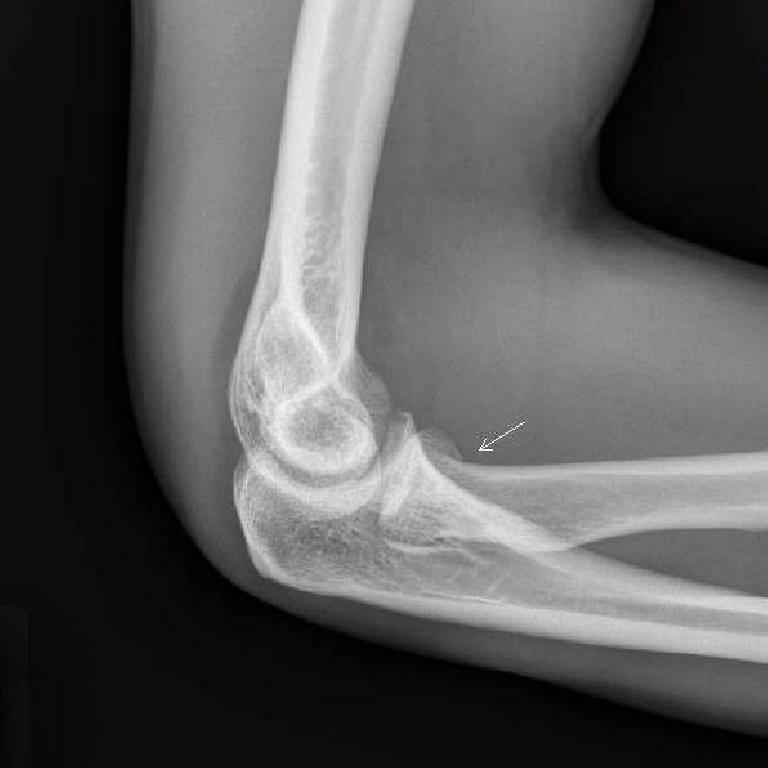 Elbow must be 99% healed! Despite it being “only” an arm injury, for the first few weeks the only exercise I could do seemed to be, ironically, pedaling the recumbent on a stationary trainer in the basement. I was disallowed to run and of course I could not lift weights or rock climb. At first this was slightly frustrating since up to that point I felt like I was getting into very good shape, both strength-wise and cardiovascular-wise. This was thus a setback. However, I adapted and actually started to enjoy stationary cycling in the basement where I could catch up on reading or watching YouTube videos simultaneously. Even after my elbow had healed, I stuck with the regimen of stationary cycling several days a week which has allowed me to exercise and read or do computer stuff simultaneously. With my high-deductible HSA insurance plan featuring out-of-control premium increases (both before and after the Affordable Care Act), the total out-of-pocket cost came out to be $384, mainly for Day 2 and Day 22 x-rays, consultations with my primary physician and a specialist, and for a flexi-cast fabricated by a skilled technician during the consultation with the latter. The cost came out to be a bit less than I was pessimistically predicting so it was actually a nice surprise. Two months after the arm fracture, my arm seemed to be fully healed with full range of motion. I did not lose nearly as much strength as I had feared; in fact, by Week 9 or 10 I was able to do about as many pull-ups (20-27) as I could before the accident. My rock climbing ability also did not diminish appreciably despite the couple months away from the sport. This post isn’t meant to be giving medical advice, but to give you an idea and hope of recovery time if this happens to you. Be careful out there—bike riding definitely has its risks!